Tozeur is very much a city relying on tourism, but everything is done in a tasteful manner. Early developers understood that it was the traditions and culture that represented the possibilities for the future. While agriculture remains an important income, tourism employs a large part of the 40,000 inhabitants. But it is not only the lifestyle and the specific architecture of Tozeur, that bring tourists out here. The city is well situated at the fringe of the seasonal large lake Chott el Jerid, allowing visits into the Sahara, as well as to many other smaller settlements. The history of Tozeur goes back a couple thousand years. 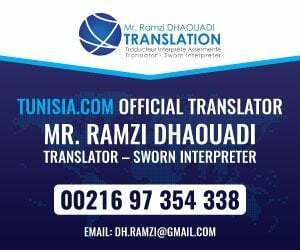 Through most of its history has been autonomous, and beyond the direct control of Tunisian rulers. With the arrival of the French protectorate, no place in the country resisted new lifestyles and education more than Tozeur. Houses of Tozeur are decorated with rectangular yellow bricks arranged in patterns. The result is one of the most distinct and beautiful architectural styles of Tunisia. What is even better, is that all new houses implement the same style. If you see a construction site, you will see that load-bearing walls are made in common concrete, and the yellow bricks are added just as decoration. This almost metropolitan city has surprisingly many bicycles,- very rare in Tunisia, and quite a number of women in black veils covering everything. Note the use of white and black ribbons on their cloaks, blue is married, white is unmarried. Ouled el-Hadef clearly has one of the most impressive desert quarters in Tunisia. This area is almost unchanged over the centuries, and some of the houses are from the 14th century. The house and decoration style is even older. Most houses are two storeys, and there are fairly few with houses towards the street. When they do have windows, they are made of mashrabiyya (small palm pieces put together in intricate patterns), which lets some light in, and casts decorative shadows on the inner walls. Light is commonly let into rooms from inner courtyards, all in correspondence with a very conservative view of women and family life. Tozeur is one of the best places in Tunisia to go door spotting. Styles vary a lot, and many doors are unique to this part of the country. Note the 2 or 3 door knockers. The number reflects the family structure, but explanations vary. One says that the third knockers is added to the door when the family has its first child, or its first son. The other explanation says that the right knocker is for the men of the house, the left for the women and the lower for the children. According to this explanation, each knocker gives a different sound, the male knocker the deepest. There is a small museum in the area, the Museum of Popular Arts and Traditions which is actually a holy man’s mansion. Here you can look into the tiny rooms of Sidi Aissa’s (lower photo), inspect decorative elements and look into old documents (in Arabic, of course). 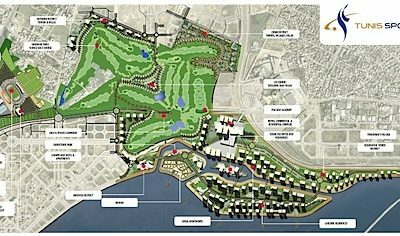 Among the latter are documents describing the manner of distributing water between the properties. There is nothing special, historical or religiously, about the Marabout of Sidi Aguili. But its setting is ideal, right where where a water canal enters the oasis gardens, and with plenty of flower bushes in front. It is among the most popular postcard motifs from Tozeur. The shopping quarters of Tozeur are among Tunisia’s most attractive. Streets are made up traditional Tozeur houses, and exhibits are very colourful. Locally made rugs and baskets seem to be among the better options for those interested in picking up a souvenir from Sahara. El Farkous Mosque is a rather new mosque, but has the highest minaret in Tozeur, and is today one of the most noted buildings in Tozeur. 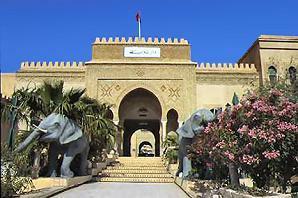 Depending on your taste, it can be argued that the Dar Cherait Museum is one of the best in Tunisia. Since it is private, it has a higher entrance fee than most other museums, 3TD plus 1.5TD for camera permit. It has exhibitions depicting life among both ordinary and the rich in bygone times. Instead of the normal bus driver uniforms, the personnel here wear traditional costume, and whenever you find a corner without other visitors, you can imagine what Tunisia was like a hundred years ago. The 250,000 date palms, and all the vegetation in between, get the water from 200 springs. The entire oasis is about 11 sq km, with Tozeur as the large centre, but there are small settlements scattered around the area. Around the city, nature is far from flat, and tiny valleys and riverbeds are found all over. Between the palms that are penetrating the city from all sides, a complicated irrigation system is found, together with plants and trees, that gives plums, grapes and strawberries. In older times, Tozeur had a very strict system of sharing water between plantations. In modern times, water pumps have made it possible with more intense agriculture. The sad result so far is a fall of the water table. 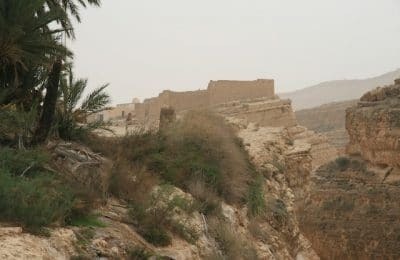 The village of Bled el-Haddar is part of the best trip through the oasis, although getting to it simply takes too little time to create the effect of a separate village. From the main road of Tozeur, it is only 500 metres. But it is historically set apart from Tozeur, with its own identity. It has one attraction, the mosque, where the minaret is built on Roman foundations (top photo). This among the very few remains of the Roman town Tusuros. The mosque is sometimes open, I was among the unfortunate. Inside you should be able to admire a stone mihrab built by craftsmen from Balearic Islands. This must be among Tunisia’s most beautiful marabout. Sid Bou Lifa is said to have planted the jujube tree which stands in front of his tomb by his own hands. The zoo and garden out here, past the Marabout of Sidi Bou Lifa is better than you might expect. The garden is well-maintained with trees and flowers of all kinds. Pheasants roam the area, apparently aware that tourists try to photograph them. I worked hard to get the photo above. The zoo is small, but has a few interesting animals, like baboons, lions, boars, snakes and a cola-drinking camel. Cages are small, so this may not be a place for tourists with a soft heart for animals. The shop here sells natural syrups, like pistachio, rose and pomegranate. I disregarded this, just to find out that there is no other place to buy these products. But by then it was too late. Belvedere belongs to the early stage of tourist development of Tozeur, and the result is so kitsch that it almost is fascinating. An unknown local artist with Jeff Koons aspirations has been let lose on a large boulder, designing three faces. Mount Rushmore? But who is the model? At nights the Belvedere is illuminated, in an attempt to please tourists at Tozeur’s more expensive hotels. Tozeur is an important tourist destination, and this is reflected in the selection of hotels and camping grounds. 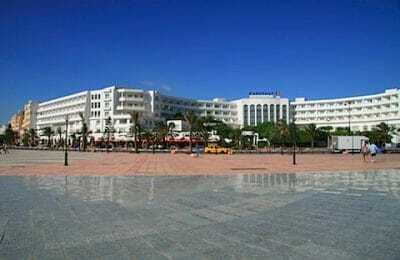 The value for money has improved in recent years, and some of the budget options here offer some of the best deals in all of Tunisia. Both for those with less money, and plenty of it, Tozeur has got it all. There are 3 camping grounds, but remember that in winter time, nights can be cold. Tozeur has many good value restaurants, many aiming at budget travellers. Along the Avenue Abdulkacem Chebbi there are many restaurants with menus posted next to the door. Posh diners are found in the posh hotels. There are some bars in Tozeur, all the ones aiming at foreign travellers are found in the better hotels. No problems. Banks, ATMs and exchange services in hotels. Most Western money is accepted (even smaller currencies like Norwegian kroners), and your only safe credit card options are VISA and MasterCard. Good connections with shared taxis or buses in directions of Nefta, Gafsa (and beyond) and Kebili/Gabes. Tozeur has also plenty of car rentals, where you can get a car on the spot, but where you should book a bit ahead if you want to get the car of your choice. In summer, Tozeur can be extremely hot. In late August 2000 I experienced more than 45?C (over 110?F). This is not recommended for children, older travellers and anyone with a health condition. The very best time to visit, is in winter.